It’s that special time of year where all the eventual best and most talked about horror films of 2015 are all premiering at the Park City-set Sundance Film Festival. One said film is easily Bruce McDonald’s return to the genre with his Halloween-themed thriller Hellions. I’ve had an eye on this one since 2013 when we learned that McDonald—the man behind the excellent Pontypool—was gearing up for some trick-or-treating fun, so it’s nice to finally start seeing it come to life. 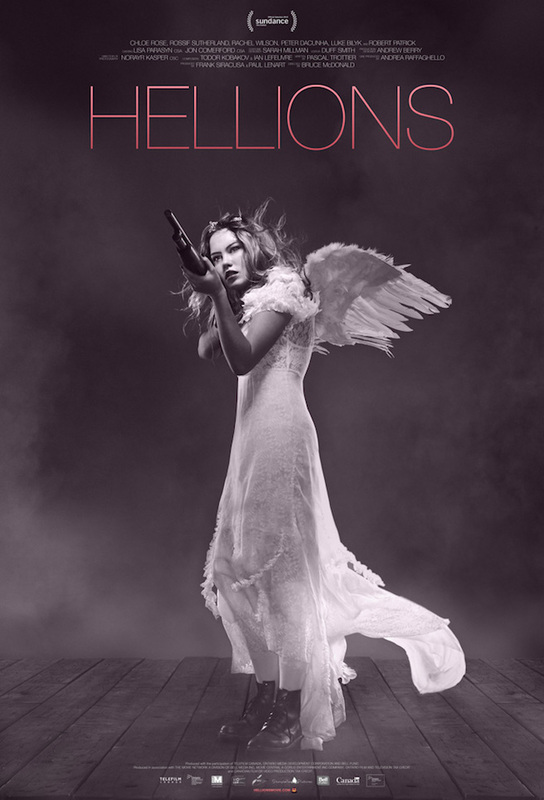 And what a start it is for Hellions, which just released a striking festival poster that shines a light on a shotgun-wielding Chloe Rose dressed as an angel. I don’t care what anyone says, there is absolutely no better setting for a horror film than a brisk Halloween night—what other scenarios can give us a badass girl destroying hellions of the night in an angel costume? Soon enough we’ll be hearing plenty of buzz (hopefully the good kind) around Hellions, but until then, take a peek at this fantastic poster. Strange trick-or-treaters plague conflicted teenager Dora Vogel (Chloe Rose) at her isolated home on Halloween. Under siege by forces she can’t understand, Dora must defend both body and soul from relentless Hellions, dead-set on possessing something Dora will not give them. Set in a visually haunting landscape, Hellions redefines the boundaries of horror with its potent brew of Halloween iconography, teenage angst and desperate survival. Hellions stars Chloe Rose, Rossif Sutherland, Rachel Wilson, Peter DaCunha, Luke Bilyk and Robert Patrick.